β-Lactoglobulin is one of the most notable representatives of the lipocalin family of proteins that are mainly involved in the transportation of small hydrophobic molecules. Therefore, the conformation stability of these proteins represents an important step for several industrial applications. In this study, the β-lactoglobulin (β-lg) conformation stability in solution was studied as a function of the protein concentration, pH, NaCl and temperature when the protein concentration is significantly higher in the buffer solution. Using small-angle X-ray and neutron scattering methods (SANS and SAXS), it was shown that β-lg forms dimeric structures in 50 mM HEPES buffer under various conditions of the medium. At pH 5.9, β-lg preserves its dimeric form in the high protein concentration range of 10–40 mg/mL. However, the conformation swelled with the addition of 50 mM NaCl in the system with 20 mg/mL β-lg concentration. Further increase of NaCl concentration leads to a decrease of the radius of gyration of the β-lg dimer. At pH below 5.9 where the protein is positively charged, β-lg dimer preserves its conformation, and only an increase of the radius of gyration was attested by SAXS as the acidity of the medium increased to pH 3.6. This supports and adds to the findings presented above regarding the stability of β-lg dimer in 50 mM HEPES buffer in D2O. Furthermore, at neutral and alkaline pH, the values of both radius of gyration and maximum particle dimension decrease by increasing the pH of the medium. This work was supported by a grant framework of the Romanian Plenipotentiary at JINR-Dubna, within the JINR Theme no. 04-4-1121-2015/2020. The authors gratefully acknowledge the beamtime received at IBR-2 pulsed reactor, FLNP, JINR, Dubna, Russian Federation, beamline YuMO small angle neutron scattering spectrometer for the proposals nos. 2015-10-15-23-59-22 and 2016-10-15-20-20-30 and to O. Ivankov, V. Skoj and M. Rulev for providing assistance during the measurements. The experiments were performed on beamline BM29 at the European Synchrotron Radiation Facility (ESRF), Grenoble, France. 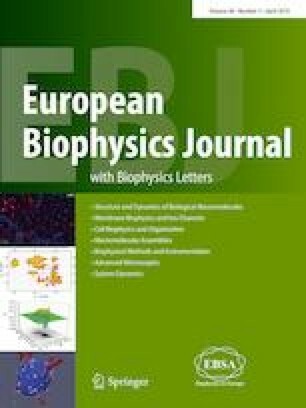 The authors are grateful to Structural biology Group and Local Contact at the ESRF for providing assistance in using the beamline.